"KEY LOGGERHEAD" Relax and enjoy watching the surf while in this beautiful, spacious, very well loved and maintained Oceanfront 7 bedroom, 6 bath home. Perfect for a family gathering or luxurious retreat. Whether you are relaxing under the gazebo with panoramic ocean views, sitting in a rocking chair, or taking a stroll on the beach - this well-equipped home will make your vacation unforgettable! The beautiful kitchen boasts spacious granite countertops, glass tile backsplash, stainless appliances, regular coffee maker, and a Keurig, microwave, dishwasher, stove/oven, and lots of bar seats and oversized dining table overlooking views of the ocean. The kitchen is open to the living area with comfortable furnishings, large flat panel television, Blu-ray player, expanded cable including Netflix, HBO and Showtime. 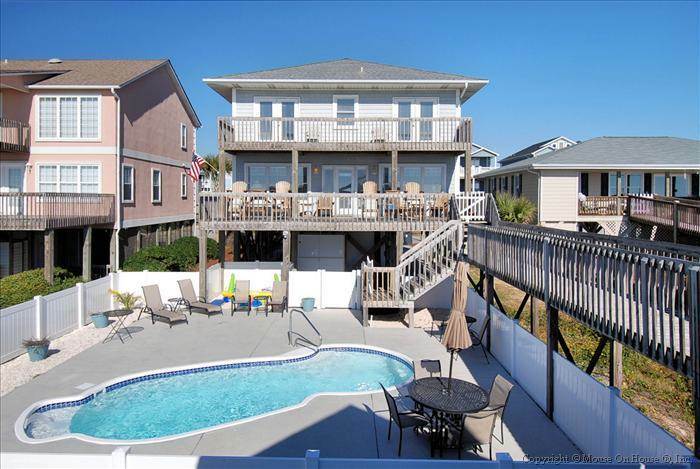 Amenities include private lighted boardwalk to the beach with privacy gates, gazebo at the end of the boardwalk, two picnic tables, outside hot and cold shower, covered porch, sundeck, free unlimited long distance. All bedrooms have private televisions DVD players. All the bedrooms have a private bathroom except for a King and 2 Queen bedroom upstairs which share a jack and jill bathroom. All of the bathrooms have been updated. Additional amenities include a new washer/dryer, ceiling fans throughout, private walkway to the beach, gazebo on the sand dunes. Gas and charcoal grill. Private Pool 11 x 26 with plenty of seating and lounging for your comfort. Nothing has been left out of this spectacular property! Non-Smoking and no pets. Sleeps: 24. Includes Blue Ribbon Linen Service: all beds will be made and towel sets provided for 24 guests.